This year, the Optima features a sleek new look, with new headlights, wheels and exterior trim pieces. 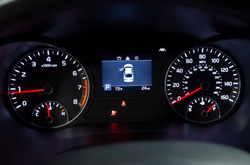 The 2019 Optima also features a standard set of comprehensive driver aids designed to increase driver vigilance and even act on your behalf, keeping you out of harm's way. The Uvo telematics system has also been tweaked to give you the best possible service, should its emergency services become necessary. There are four Optima trim models available: the entry-level LX, mid-range S, sporty EX, and luxurious SX. The Optima LX saves you the most on up-front costs, giving you a great deal on comfortable, family-friendly travel. This model also features standard LED daytime running lights to help other drivers spot you on the road. Its matte gray grille turns heads on the highway. Step up to the Optima S for a longer list of modern features. In addition to the standard LED daytime running lights, the S adds LED taillights to increase on-road safety. This model also has its own exclusive style, featuring gloss black exterior trim and strong, 18-inch alloy wheels. In the Optima EX, you'll enjoy increasing luxury. 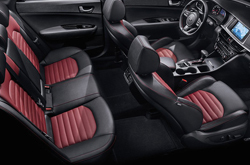 This sedan features brand new leather seats with seat heaters to increase comfort on commutes and road trips. The EX also includes ambient multicolor interior lighting, giving the Optima cabin a seductive glow on nighttime rides. Finally, the heated steering wheel keeps your fingers warm all through the cold season. The top-trim Optima SX introduces LED fog lights, increasing safety as you cut through the gloom on a misty morning. The SX also features the line's most powerful engine, giving you the power to leave the competition in the dust. When you add the optional SLX package, your Optima SX can be outfitted with either red-and-black or bronze-and-black leather seats. When you choose the 2019 Kia Optima, you also get to choose between three powertrain options. 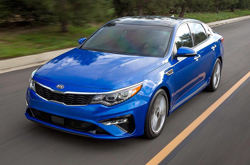 The Optima LX and S trim models feature a 2.4-liter four-cylinder engine that makes 185 horsepower and 178 pound-feet of torque. This engine is paired with a smooth-shifting six-speed automatic transmission for a refined ride. When you choose the Optima EX, you're getting the turbocharged 1.6-liter four-cylinder engine. It delivers 178 horsepower and 195 pound-feet of torque, balancing a sporty ride with impressive fuel economy. This engine also features a seven-speed dual-clutch transmission for increasing fuel efficiency at high speeds. It earns the line's best EPA ratings, achieving 28 city/37 highway mpg. Next up is the Optima SX powertrain, a turbocharged 2.0-liter four-cylinder engine. This powertrain offers the speediest ride, generating 245 horses and 265 pound-feet of torque for highway merging and passing. 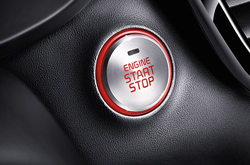 This engine is mated to a six-speed automatic transmission that's quick to respond to your requests. In government crash tests, the 2019 Optima earned a perfect five-star rating for overall protection. More than that, though, it also came out on top in frontal, side, and rollover crash tests. 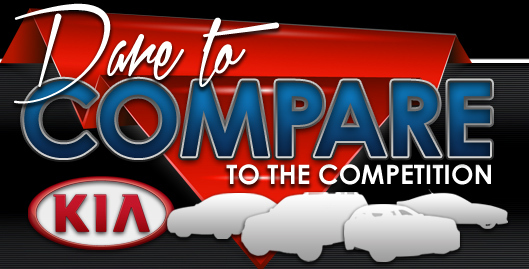 This savvy sedan also earned top rating from the Insurance Institute for Highway Safety. It earned the IIHS's top score of "Good" in every single crash test. The Optima also earned a rare score of "Superior" for its frontal crash prevention system. The frontal crash prevention system both warns you of danger and actively seeks to keep you from harm, automatically applying the brakes to mitigate damages. The Optima offers additional driver aids, including blind-spot warning and lane keeping assist, to help you avoid dangerous situations. Contact Camelback Kia in Phoenix for more information on the 2019 Kia Optima or visit us for a test drive.